Resolve labor or transport shortages by marking a service as sub-contracted. Sub-contracting is the process of bringing in staff, vehicles, or other services from a third-party supplier. You may need to sub-contract a service if it’s a service that you don’t supply, or if you have a staff or vehicle shortage. Setting a service as sub-contracted mirrors the sub-rent process for products. 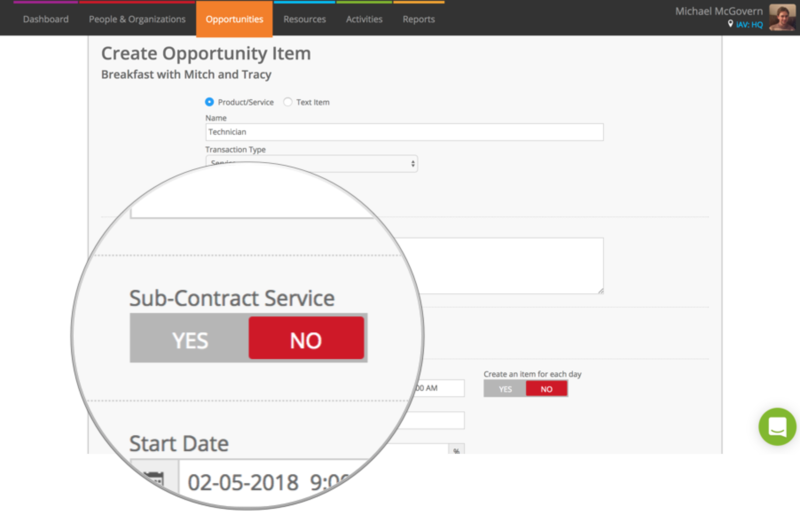 When adding an item using the “Add new opportunity item” screen, toggle the “Sub contract service” slider to YES to tell Current RMS that you’re sub-contracting this service. If you’re working on an order, provisional quotation, or reserved quotation, a new field will appear where you can set the supplier. Choose an organization from People & Organizations as a supplier, i.e. the vendor or third-party providing the service. Optionally set a reference.As you type, Current will suggest from organizations in People & Organizations. The cost rate definition, group, and price will be pulled from the service initially. If you choose a supplier, supplier costs may be used. If you pop in a supplier and the costs change, Current will flash updated fields and let you know what’s changed. If you’ve added an item to a draft or open quotation, edit the item by clicking the blue arrow and choosing Edit from the menu. Toggle the “Sub-contract stock” slider to YES. Edit the opportunity item by clicking the blue arrow and choosing Edit from the menu. In the “Resource Allocations” section, hit the green add allocation button, then choose “Sub-contract booking” from the list of options in the drop-down box. Choose an organization from People & Organizations as a supplier, i.e. the vendor or third-party providing the service. Optionally set a reference. In the quantity column, specify the quantity of the resource coming from this supplier. You may create multiple sub-contract allocations for a single opportunity item – perfect if a single supplier doesn’t have enough staff or vehicles to cover your order.